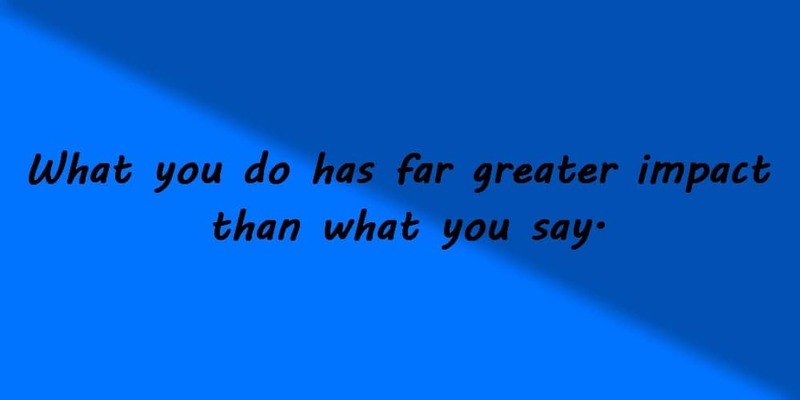 HomeCharacterWhat you do has far greater impact than what you say. Last week I wrote an article about the following quote: “Knowledge will give you power, but character respect.” Today’s quote is somewhat similar because it deals with the importance of our actions, much more than the importance of our words. The power of our actions might be bigger than the power of our words, but that isn’t entirely true either. The impact of an encouraging word might change the life of a person entirely, and the impact of a negative word might have a drastic effect on somebody’s life as well. But, for those living close to us and watching how we live day in and day out, our actions tell a much more important story than our words. Look at the quote above and think about it for a while. What story are you telling the people around you by the way you live? Does the way you live encourage others to follow in your footsteps and become more like you? I believe our actions speak louder than our words, but we must not despise the power of our words. They are able to change the course of people’s lives, and they are capable of setting the direction for our own lives. The Bible says that the power of life and death can be found in the tongue, so which direction will it give your life? But, watch out so your real actions tell the same story as your words!